Listen online radio and streamings from your worlds of Minecraft. 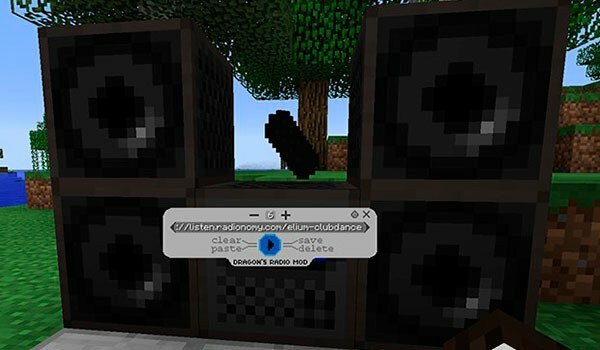 Dragon’s Radio 1.7.10 is a mod that allows us to crafting radio and speakers in Minecraft to hear what is playing on the radio. The radio is not simply adding a music player for the songs we have in the computer, but allows us to listen and streamings online radios through Internet without leaving Minecraft. To start we create radio and speakers. Then crafting the “tuner” that will allow us to connect the speakers to the radio by right-clicking each speaker and then the radio. You can connect up to 10 speakers. The more we have, the better the music will be heard from a distance. To tune to online radios, we paste the link of streaming online radio or the radio interface we’ve created. The URLs that can be played on the radio, should end in .mp3, .m3u or .pis. ¡Listen to radio and live streamings from Minecraft!